Fieldy is what we call modern art. 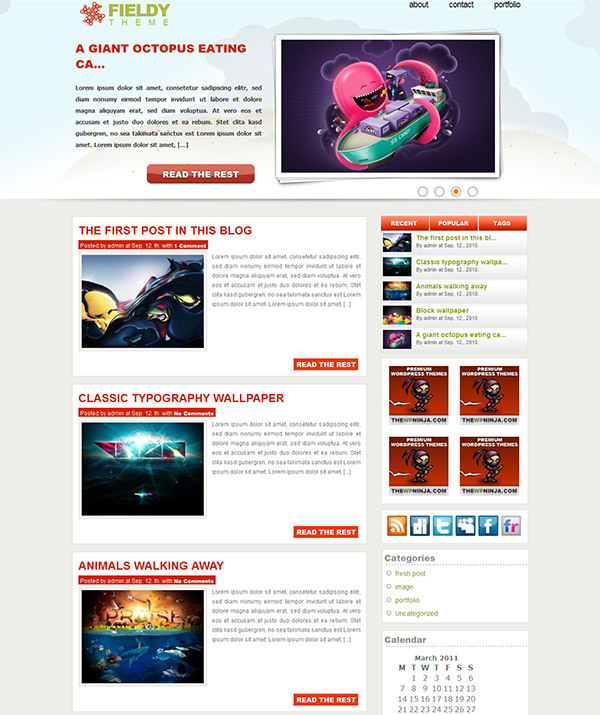 It has a stylish content slider on the top, that you can customize to show posts or any other custom content. The theme has everything that you may need for daily blogging. The theme has a built in custom admin interface that lets you change almost everything in the theme. Enable or disable elements, change or disable content sliders and so on. No HTML knowledge is needed to customize the theme. This theme has six different color styles that can be changed through the custom admin interface. All you need to do is choose a color style and save it. With the Fieldy Premium WordPress Theme you are getting: A modern and unique design, custom admin interface, complete installation and usage guide, built-in scripts, special script free menu, PSD logo source, single 300px wide sidebar widget space and two 140px wide sidebar widget space, built-in advertising options, content slider (can be disabled) with post listing function and a Google Analytics ready code, integrated Twitter box in the footer.